Farmers of 15 villages in Bhavnagar district of Gujarat, went on relay fast from March 2 protesting land allotment to detergent manufacturer, Nirma, for a cement plant and a limestone mine near Mahuva tehsil. The company has started preliminary work at the site. The farmers have threatened to intensify their stir if the projects are not scrapped. But the government is paying little heed to the protests on since last year. 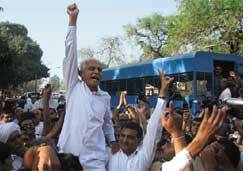 On February 25, police prevented over 11,000 farmers and activists from holding a protest march from Sabarmati Ashram to the state capital Gandhinagar. Around 5,000 protestors, led by 92-year-old social activist, Chunibhai Vaidya, and bjp legislator from Mahuva Kanubhai Kalsaria were arrested before they could start their 22 km march. The next day, 15 village representatives who went to meet chief minister Narendra Modi, to present their memorandum, were detained outside the assembly gates. “The chief minister asked me to leave the protest and said the government would tackle the villagers,” said Kalsaria. He said he was not deterred and would fight on. Earlier on February 20, villagers led by Kalsaria were beaten by police during a peace march near Mahuva. The next day Kalsaria and his wife were attacked by goons allegedly engaged by the company; the two were hospitalized. Nirma’s spokesperson did not respond to the allegations. Bhavnagar’s superintendent of police, R V Asari, said Kalsaria was only protecting his votebank. “The land sanctioned for the plant is wasteland; any construction on it would bring development to the area,” he said. The Gujarat government allotted Nirma group 288 hectares for a cement factory and 3,000 hectares for mining in 2008. Villagers are opposing it because the land allotted is fertile and the projects will contaminate their water source (see ‘Land goes to industry’, Down To Earth, July 1-15, 2009). The protests intensified in May last year after the villagers were kept out of a public hearing organized by the government in Mahuva. “The farm produce in the area is so high that it sustains 51 vegetable dehydration plants that employ over 10,000 and have an annual turn-over of Rs 300 crore,” said Michael Mazgaonkar, an activist. Farming and allied activities would be hit and 50,000 persons will have no work if the projects are allowed, he added.